The Log Cabin quilt block is probably one of the most recognizable blocks and dear to the hearts of many. It seemed to become very popular during the Civil War in the United States, but many records indicate it has been around for a much longer time. Although there are many variations of the Log Cabin block, the most commonly used version is what you see here. By most accounts, the centre square was made of a red fabric -- to signify the hearth of the home, or a yellow fabric -- to signify a light in the window to welcome visitors. The "logs" were then added, one by one, around the centre square until the desired size was achieved. There is a definite dark side and a light side to the finished block -- which, in the end, is what creates the quilt design. (Probably the most common width of these "logs" used by today's quiltmaker is 1 1/2".) Then each new log increases in length proportionately. The pattern instructions indicate the order in which each log is added to the block. Seam allowances should be pressed after each new log is added, and toward that new log. This will make a nice, flat block in the end. However, make sure not to stretch the logs during the pressing process. 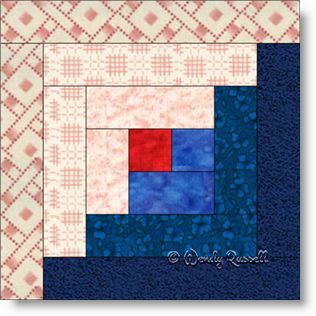 I have shown four different quilt layouts for this block to give you ideas of what you can do. These are by no means the only selections. A simple internet search will yield dozens and dozens of block arrangements using the Log Cabin block. To me, this is one of the things that makes quiltmaking so fascinating -- one simple quilt block can create so many different looks for your quilt.